For ethical & reliable GPS tracked leaflet distribution Camberley GU15, Abracadabra Leaflet Distribution can offer you a complete service. Our leaflet delivery service is second to none and we will always send you a report on completion of the flyer delivery round so you can view the exact route our leaflet distributor took. In addition to this, we offer geotargeting to ensure you are tapping into potential target markets in the most cost-effective way. After all, the success of your campaign is very important to us as the more successful it is the more likely you are to use us again! For this reason, we also encourage you to make use of our free one-to-one consultation which gives you the unique chance to chat with one of our in-house marketing experts. After this you will have a clear idea of the direction you want your leaflet campaign to take and you can use our graphic design team to ensure your leaflet design is as effective as it can be. Of course, our leaflet distribution service wouldn’t be complete without giving you the ideal opportunity to get amazingly low prices on your printing! You can get a massive discount on your flyer delivery when you order both your print and flyer distribution together from us and we can tailor exclusive design, print and distribution packages just for you. To give you added peace of mind, we are proud members of the Leaflet Distribution Organisation (LDO) and abide by their code of practice. But don’t just take our word for it – see what our clients have to say about us by visiting our testimonials page! As the saying goes ‘the best things in life are free’, so let’s start by telling you a host of FREE services and other benefits we can provide for your flyer distribution campaign. FREE report on the completion of GPS tracked flyer delivery, so you can view the exact route the flyer delivery person took to deliver your leaflets, as seen in the above image. We offer a FREE one to one consultation for your leaflet distribution campaign. FREE advice is provided on the best possible way to plan your promotion. Discount on our customised design, print and distribution packages. You can choose any quantity between 1,000 to 500,000 and it can be distributed by our GPS tracked delivery staff. We can definitely ease your stress for your time sensitive marketing and promotional campaign with available services of between 1 Day Guaranteed – 14 Day Guaranteed. FREE report of household numbers for all areas so you will know how many leaflets to be printed. FREE region specific demographic information regarding ownership and house type, as shown in the example image below. Plus 1– Your leaflet is accompanied with just 1 non competitive flyer, magazine or sample. Plus 2– Your leaflet is accompanied with just 2 non competitive flyer, magazine or sample. Plus 3– Your leaflet is accompanied with just 3 non competitive flyer, magazine or sample. Camberley is a town in Surrey, England, 31 miles south-west of central London. The town lies close to the borders of Hampshire and Berkshire. 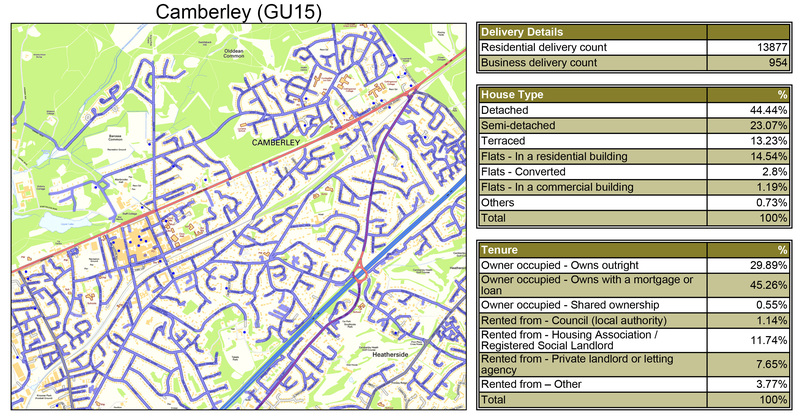 Abracadabra Leaflet Distribution Camberley can offer an efficient leaflet distribution in the postcode GU15. With our flyer delivery service attracting a repeat business rate of over 78%, you can’t go wrong with our complete service. To learn about more areas we cover, please visit our coverage page.